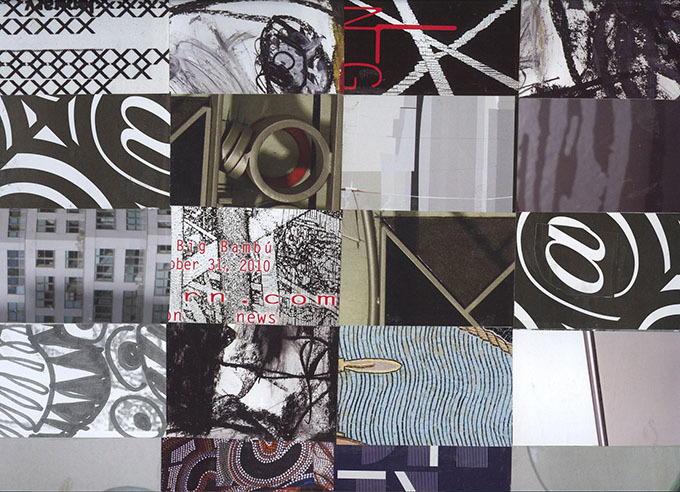 The first image shows magazine papers in red, painted papers, and papers with text in black, red and white. I cut the papers and created hearts in halves to show that two halves pieced together would make a single heart. I believe relationships are about how we connect. We start apart and we come together. Collage is about putting things together. I included some of the backstory in the blog about Valentine’s Day, and showed collage versions of Valentine’s Day cards with heart images. The image nearby is a Valentine card I created with hearts and a figure from a fashion magazine. The model is seated on a plush red sofa and the hearts are floating above her head – larger than life. See more traditional cards with hearts in the Hearts for Valentine’s Day blog post. I always look online for what people say about collage. Frequently it’s described in terms like cut and paste. I believe we live in a cut and paste world. That’s a big reason why collage is so contemporary. I found an article online from the Financial Times – Visual Arts (March 3, 2017 by Emme Crichton-Miller) titled Cut and paste: the art of collage – works of fragmented reality come together in two concurrent shows in New York and London. 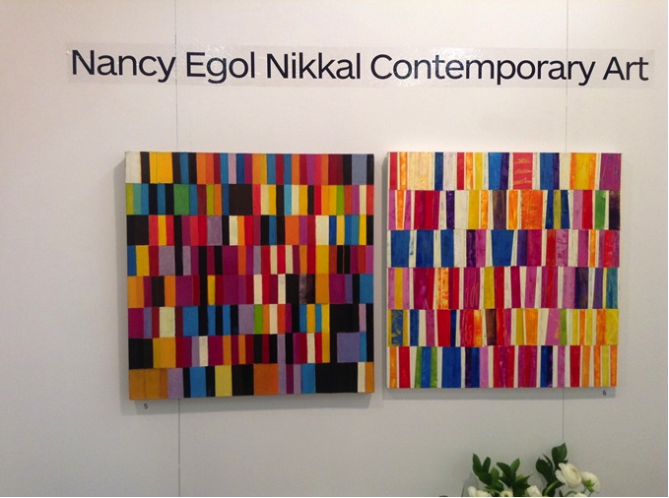 The exhibit is in New York to April 15 and in London March 10-May 13. It’s a fascinating article and references historic and contemporary collage. Read about it here. 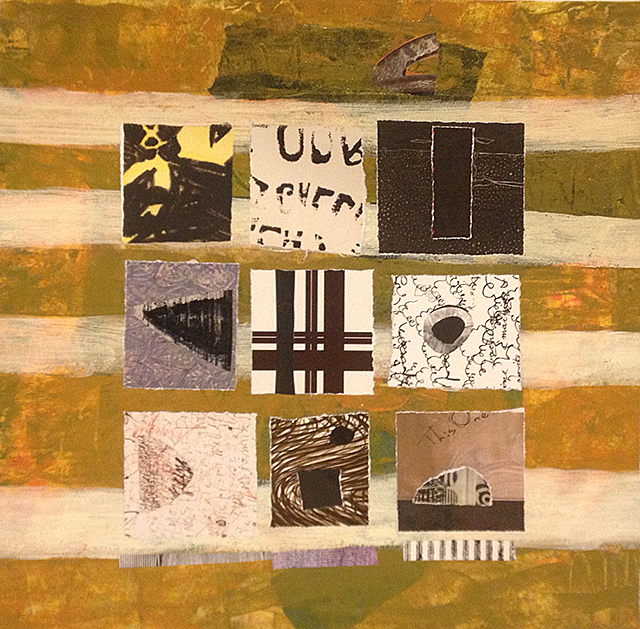 My studio practice is painting and collage, but I make collage differently than most collage artists. I paint papers for collage and cut and paste them into geometric grid patterns. I put the papers together in ways that emphasize color relationships. The image nearby is titled Blue & White Diptych and is made with painted papers in shades of blue, cut into triangles and pasted on 2 wood panels. Together, the panels are 24 inches high and 32 inches wide. Notice how the triangles move left to right and go from lighter to darker as they move within the collage. The image nearby is titled Blue Triangle Diptych, and done as two panels that are 24 inches high and 32 inches wide. The right panel is an acrylic painting, 24×16 inches, that looks like a collage. 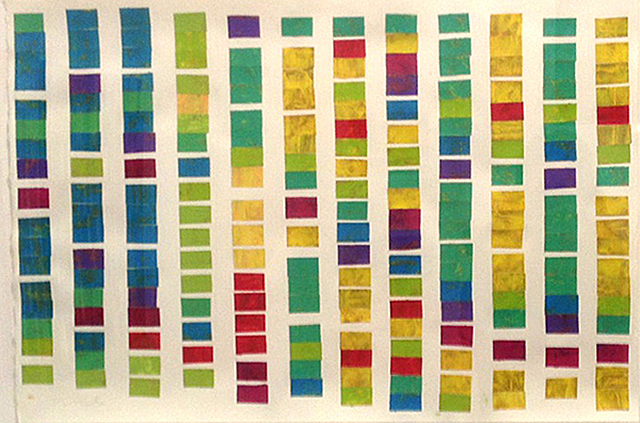 The left panel is a collage with painted papers, 24×16 inches that has a triangles done with layered paint. Some of the underpainting shows through. The colors in the painting are blue, green, pale sienna, white, black and grey. The left panel has only right angle triangles made with two pieces each. The right panel has triangles with all different angles and shapes. I did the painting and collage separately. By chance, I put them together, and decided they speak to each other and belonged side by side. If I flip the panels left and right, they look different, so it’s important to keep them exactly as they are. I work with acrylic paints and mix all my colors. Everything I do is about color – even black and white are colors because they are mixed. My current studio focus is about triangles and the colors blue, white and black. My previous focus was grids and the series titled Metro. I wanted to learn to love the color green. That meant a serious focus on one color. When I paint, no color is straight out of the tube pure. Nothing is exactly red or blue, yellow or green. Nothing is exactly white or black. I play with the basic colors and paint colors in layers to show how they interact visually. If you want to learn to paint papers, see my video tutorial Painting Papers with Nancy Nikkal. 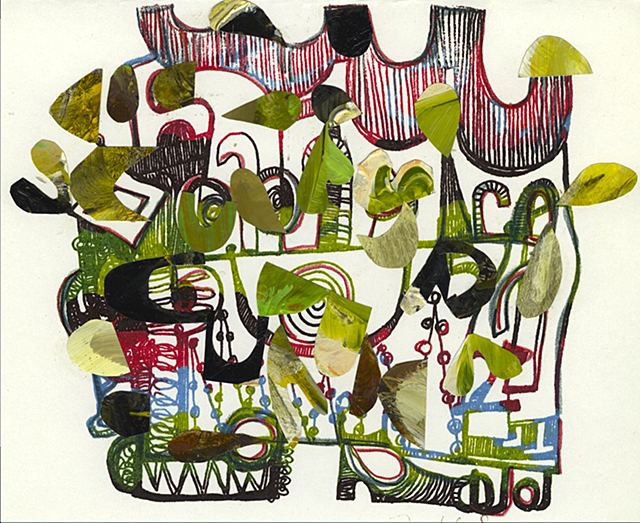 Please also see my green paintings and collages in the Metro Series. Are you fascinated with color? I see color, not just as art, but as everything in my everyday life – in the city and in the parks, in plants and trees, the ocean, the sky, in cinema, television and magazines I read, the flowers I arrange, the clothes I wear, the design and furnishings, paint on the walls at home, table settings, even the food on my plate. Color is everywhere. Here’s an extra – a little information about the science of color: In physics, a color is described as visible light and has a specific wavelength you can measure. Black and white are not considered colors because they do not have a measurable, specific wavelength. Black is described as the absence of light. White light (seen through a prism) contains all wavelengths of visible light and reveals the entire color spectrum. 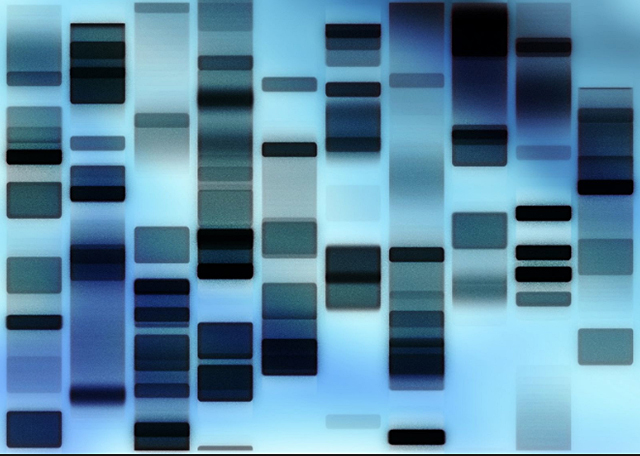 If we discuss paints and dyes, we understand what we see is a reflected wavelength. So there’s a science to paints and dyes also. 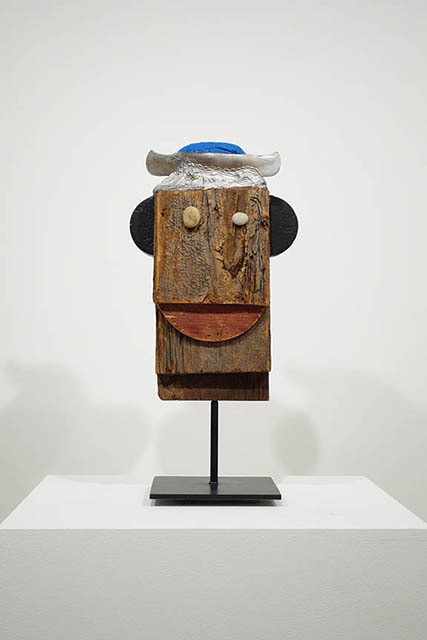 I used the phrase “Collage Artist Extraordinaire” to describe Ivan Chermayeff in my review of the exhibition ABOUT FACES (March 20-April 19, 2014) at the Pavel Zoubok Gallery at 531 West 26 Street, in NYC. Read it here. Pavel Zoubok says: no art form expresses the character of the twentieth century and the contemporary moment with greater clarity and immediacy than the art of collage. The Gallery is the place to go if you are a fan. 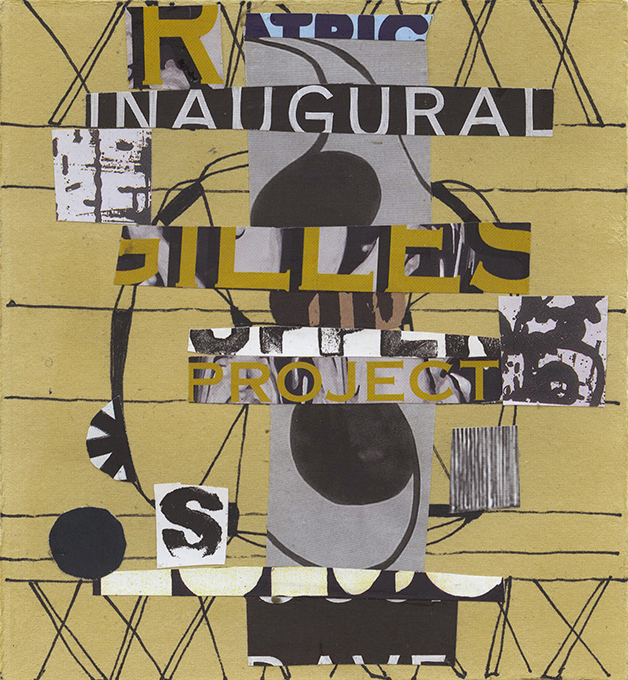 The exhibition calendar includes both historic and contemporary collage artists. Read more here. 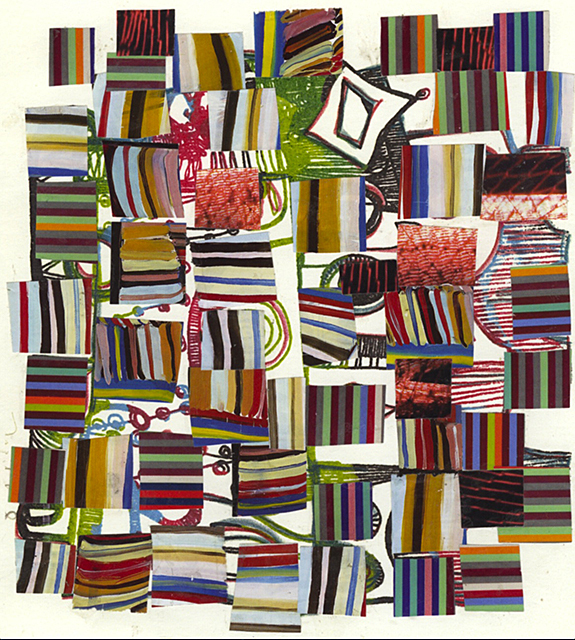 I’ve been a fan of Ivan Chermayeff’s collages for years and years, but only saw reproduction in art magazines. ABOUT FACES included collage and assemblage (sculpture). Each wood assemblage included found wood and objects like toys, tools, river stones, sandpaper, and/or brushes. Two works included a found glove that became a face portrait. 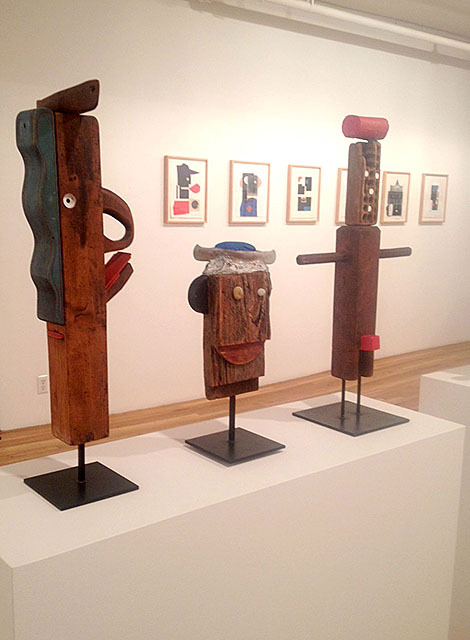 My photo (above) shows the gallery installation with 3 wood assemblages by Ivan Chermayeff. Titles are: (left) Janus Head with Canoe Hat, (center) Portrait with Pincushion Cap, and (right) Young Person with Hairless Brush Head. I’ve included solo images (two views) for each sculpture below. All images are courtesy the Pavel Zoubok Gallery. Sculpture should be seen in person, where you can walk around and see different views. The front and back are sometimes very different in Chermayeff’s assemblage. 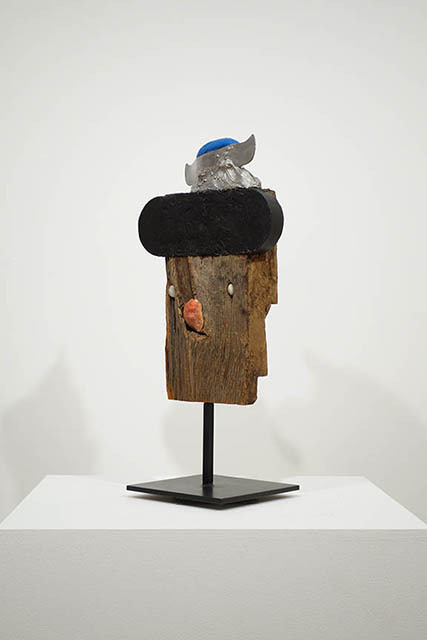 The image (above) is titled Janus Head with Canoe Hat (2000-2005), mixed-media assemblage, 23 ½ x 8 ½ x 8 ½ inches. Click on the image and enlarge it to see more detail. Look at the nose. I think it looks like the handle on a coffee mug, big enough for you to put your hand through. Notice the hat is actually a little carved wood canoe. Notice the lips on the mouth are wood and painted red. Look at his expression. I think he looks grumpy or is sulking. Read whatever you like into his expression. The image (below) is a profile view of the same sculpture, and, when you look up, you see the bottom of the canoe on his head. I think the wavy blue painted wood on the side is shaped like a child’s drawing of waves in the ocean. You don’t see the waves in the image above, but you can see the shape better in the image below. I checked Wikipedia for information about Janus – the ancient Roman god of doors, passages, endings and times (representing war and peace). FYI: The month of January is named for Janus. Janus is usually represented with two faces. 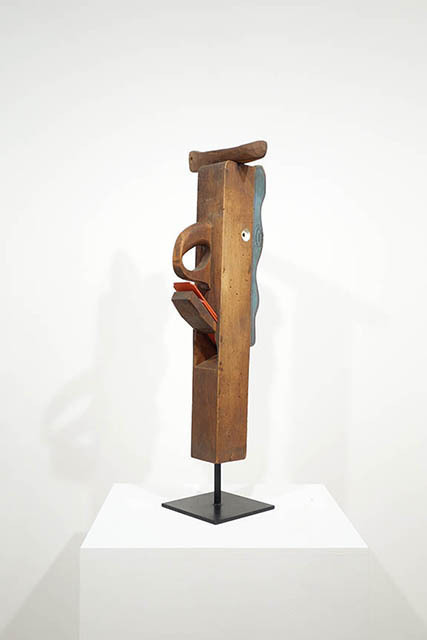 I wonder if Chermayeff named his wood sculpture Janus because the sculpture includes part of an old wood door. Read more about the god Janus here. He collects garbage like crazy. 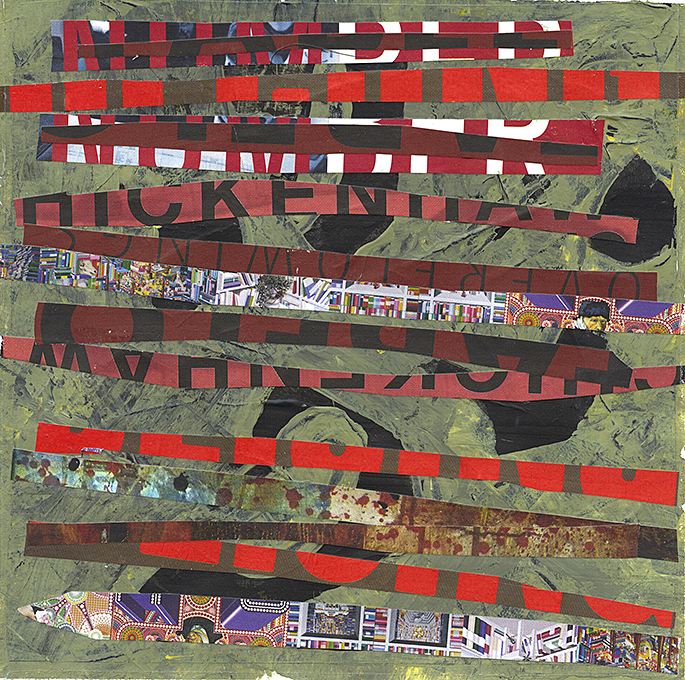 I include a collage (above) titled Red Talker, 15×11 inches (1995). Chermayeff says he collects garbage like crazy. 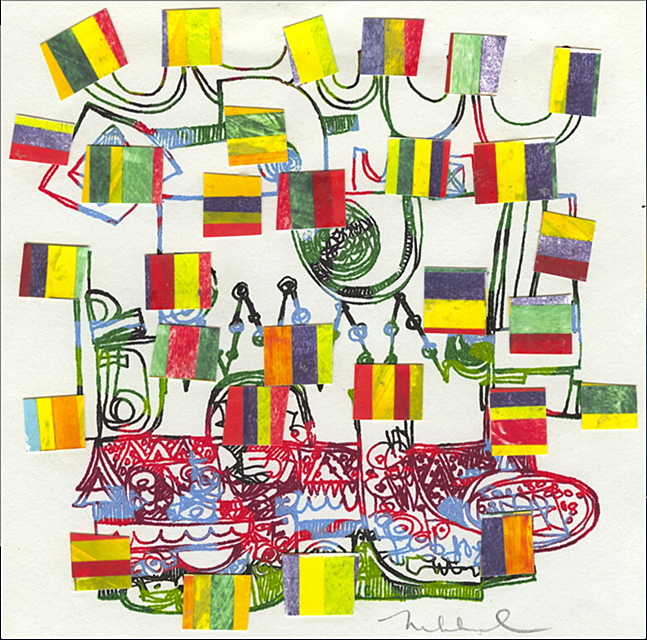 According to the Gallery press release, his collages include the stuff of everyday life: scraps of paper, stamped envelopes, tickets, photographs and other discarded oddments that become juxtaposed compositions of color and form. Chermayeff says: “A little spot, whether a postage stamp, a graphic mark, a letter of the alphabet, a splash of color becomes a nose, an eye or a mouth. In the right place, more or less, it becomes a face…that is both recognizable and rewarding. When a face is there, it has its own reality, whether recognized or not, much like strangers passing in the street.” Read Gallery comments here. Notice the colors in Red Talker: black, white, red and a peachy-tan. The portrait is all torn and cut papers in geometric shapes: squares, rectangles, circles and triangles. He’s facing right, and wears a hat. He has a large white dot for an eye. His mouth is a torn red and white address sticker. See more gallery images here. 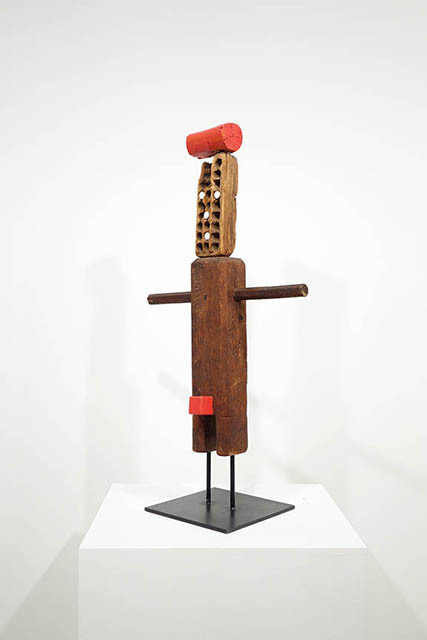 The image (below) is a front-facing view of Chermayeff’s mixed media assemblage titled Portrait with Pincushion Cap (2000-2005), 13 x 8 ½ x 3 inches. Notice the deep grain in the wood and how the artist used smooth round white river stones for eyes. The stones are different sizes. The larger one faces vertical and the smaller one faces horizontal. The mouth is wood painted red. Ears appear on the side of the rectangular head as semi circles painted black. The pincushion cap (painted silver and blue) is another toy wood canoe sitting across the top of his head. The image (below) is the rear view of Portrait with Pincushion Cap. Click on the image to enlarge it. Notice the rough surface texture in the wood in this view. There’s a deep recess gouged into the wood. I see a different face. The eyes are still white river stones, but they look tiny. The mouth is part of a negative space so it looks like his mouth is open. The “nose” is a rosy red blobby shape stuck into the gouged surface. The ears are gone, replaced with a solid black band of wood with rounded ends and now looks like a hat. The toy wood canoe (pincushion) sits on top. I think he looks like a drunken Russian sailor or an old Viking. It’s another Janus with two faces. 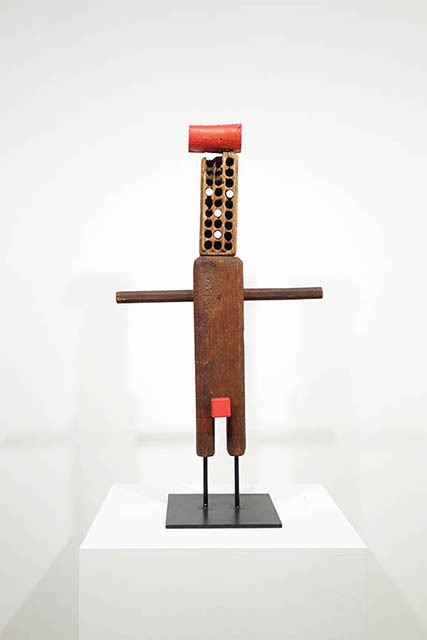 Two images (below) are front and side views of the mixed media assemblage titled Young Person with Hairless Brush Head, 24 x 15 ½ x 4 ½ inches (2000-2005). Notice Chermayeff added wood dowels for this portrait’s 2 arms. The Head is an irregular shaped rectangle. It’s an old hairless brush with 27 holes in 3 vertical rows. There’s a painted red wood dowel planted across the top of his head and a painted red block projecting between his legs. The wood figure looks like he’s wearing cut-off pants. His feet are thin black metal rods that run down to a square metal base. What do you see? I see a portrait of a young boy. Do you think the sculpture is innocent and childlike? I think maybe not. 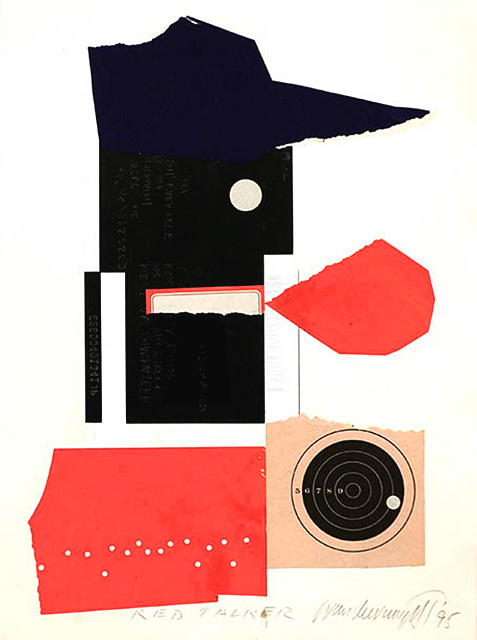 Ivan Chermayeff’s fine art collages and assemblage sculptures have been exhibited throughout the United States and internationally. His next exhibition will be in the UK. He is best known as a designer and illustrator. With Tom Geismar, he founded the design firm Chermayeff & Geismar (1957), and the logos they’ve designed are recognized worldwide. In my previous post, I wrote you have to see Chermayeff’s assemblage sculpture in person and walk around to view the work from every angle. I hope the additional images here gave you more information. Please add your comments below. Do you like this artist’s mixed media assemblage? Do you prefer the collages? Do you think assemblage is 3D collage? 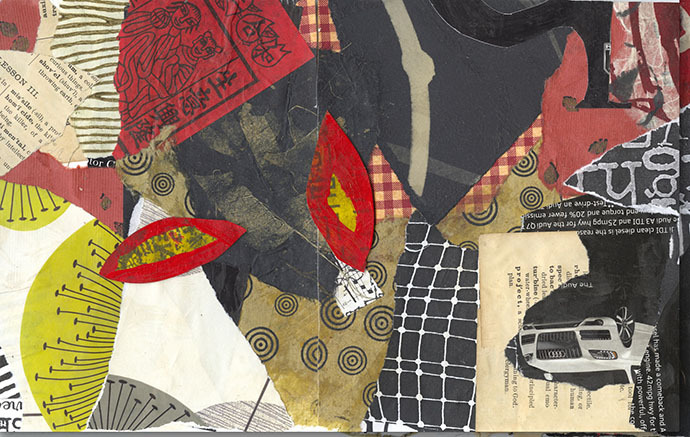 I teach a collage class at the Pelham Art Center in Pelham, NY. We have a new collage project each week. Almost every project has paper as the primary media. We are half way through the fall term and have run out of magazine papers – our primary source for collage. I supplied the magazines at the beginning of the class term, and the students have depleted the supply. We need more magazines. I would like the students (or a donor) to replenish the supply. I don’t want junk magazines. Cheap paper is a waste of time. It’s very hard to create collage with cheap paper. It curls when you apply glue. It’s hard to cut and tear. It doesn’t hold up over time. It looks cheap. I want students to work with quality magazines papers that are printed with rich color, offer strong graphic design, and use creative text. Replacing the ArtForum magazines would cost me much more than I want to spend. I would like every student to donate or find a donor neighbor. So many people toss away magazines or put good magazines into recycling bins. Collage artists recycle. We need good magazines. Magazines I like include art, photography, internet, home decor, fashion, garden design, nature and more. The paper quality is important. ArtForum, ArtNews and Art in America have good paper. I like Vogue, Elle, Elle Design, W and Interview magazine. National Geographic is excellent for paper quality, color, nature and animal images. I will ask my friends and neighbors for donations. I would like my students to do the same. I’m a snob for good paper. In my own collages, in addition to magazine papers, drawings, and my painted papers, I use artist hand-made imported printmaking papers because I love the range and contrast of whites. A lot of my white papers go in as the background layer in a collage. Good Paper is Expensive. Good paper makes a Good Collage. 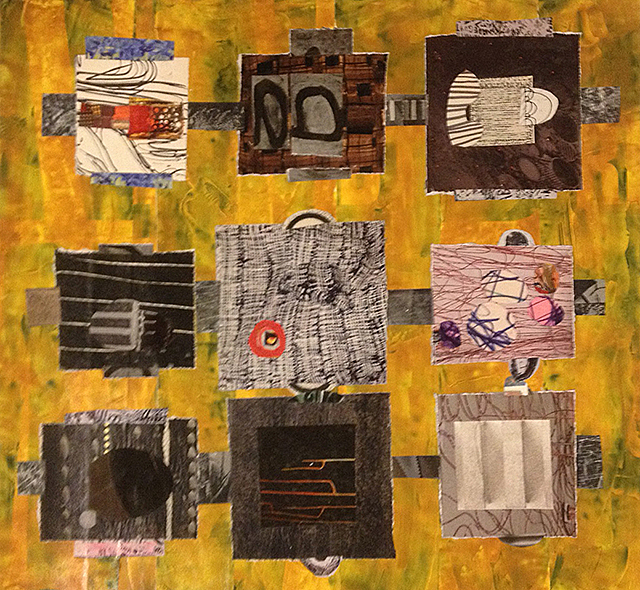 In recent class projects we created large collage papers with multiple small magazine papers. See the first image – a grid collage above. It’s a substrate for a figure collage. In another class, we created a crazy quilt collage with overlapping patterned papers. See my sample image below in red, black and white. I will add another layer. In a third class, we created a background collage for a landscape. We used pieced papers from a lot of different magazines. I asked the students to keep the originals and reproduce multiple copies in black and white and color. The copies become the resource media for additional collages: as collage paper and as a paper substrate (bottom layer). Papers can be reproduced from the original as needed. 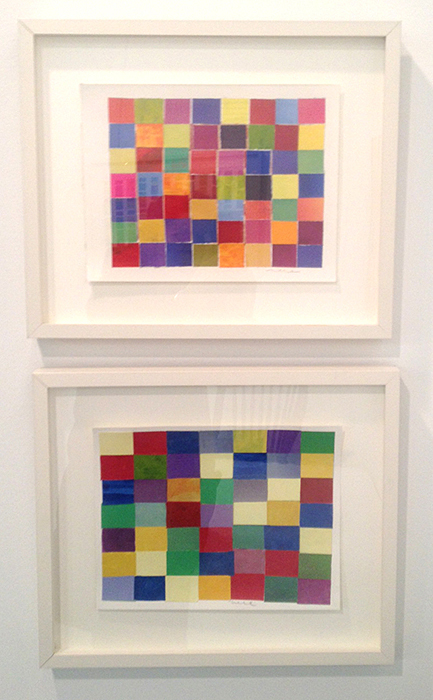 If the original collage is copied digitally, it can be reproduced in a copy shop in very large format. You can play with the image and color in PhotoShop. I like to include drawing with collage. See the 3rd image above that I made on artist paper and stamped all over with a bird pattern. I cut and paste small sections whenever I want line drawing in the collage. I included two images that are computer scans of a rug (advertisement) from a design magazine. I like the diamond pattern and needed one to be positive (black on white) and one to be inverse (white on black). Create projects that create (generate) papers. Create projects that repurpose and embellish papers. 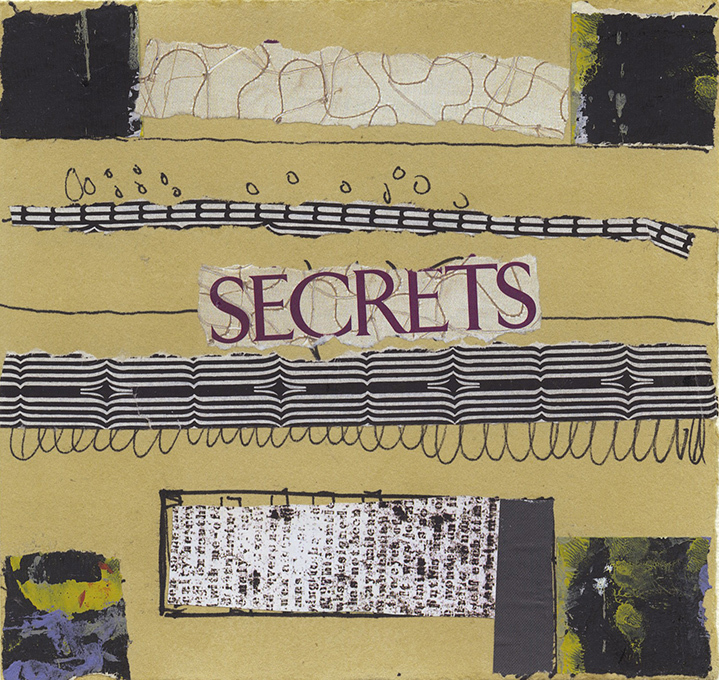 Discuss how to sort and organize collage media. Discuss why it’s important to collect, create, reproduce and build inventory for collage – because it saves time and money, it makes your media personal (you can pick the colors you like), and it’s much better to have all your papers available when you are ready to work . Please add your comments and suggestions on how to hunt and gather materials for art projects. Thank you for sharing. Thursday, Feb 14 was Valentines Day. I hope everyone was able to share the love. I was in NYC that day walking on Fifth and Madison Avenues from Grand Central Terminal to 34th Street. All the shops, department stores, and restaurants had red heart-shaped helium-filled balloons and red flowers in tubs in their windows or just outside on a sidewalk table. People were walking hand in hand. Some were carrying flower bouquets to take to the office or home. I saw a little boy holding flowers wrapped in clear plastic. He held the flowers in one hand and held his father’s hand in another. I imagine he was bringing flowers home to his mother. NYC was one big Valentine. The image below is one of four collages I am sharing in this blog. 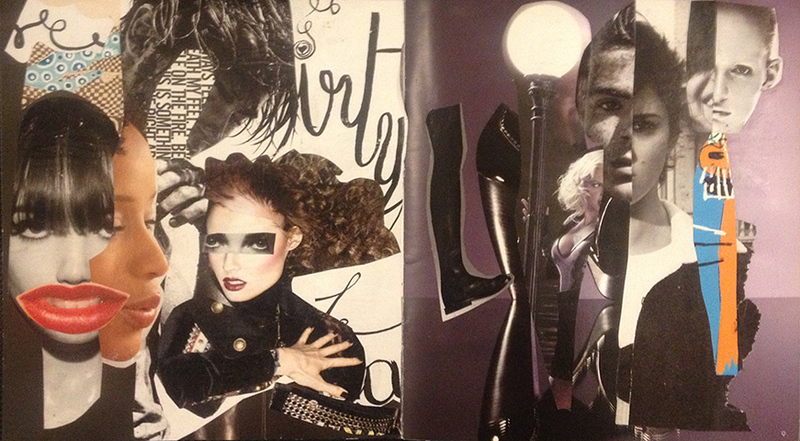 All four images are titled Barneys because the collages exist in a Barneys New York shoe and boot catalog. 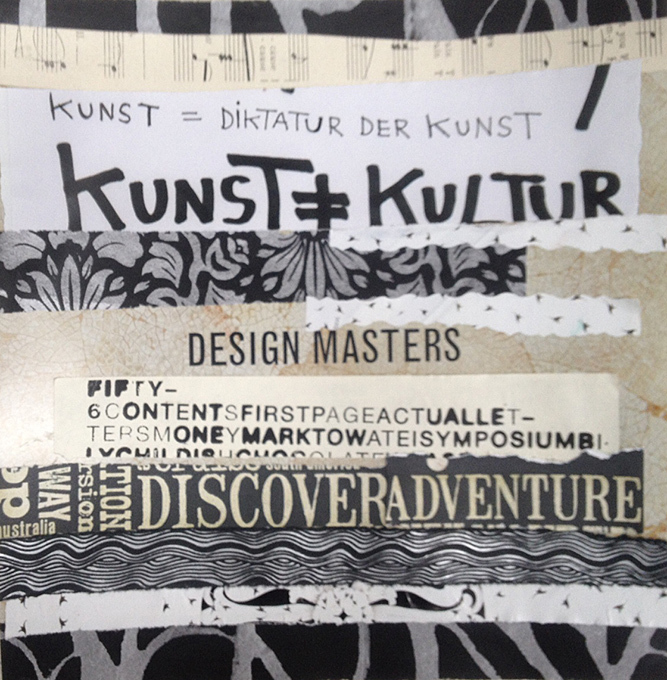 I received the catalog in the mail, and thought it was a perfect way to recycle consumer media with collage. The catalog is still a work in progress. I sometimes show the catalog to my students when I discuss how important it is to recycle postcards, catalogs, books and junk mail. It’s so easy to add images to existing backgrounds. And the paper is free. Being in NYC on Valentines Day made me think about sharing the love, and that made me think about important blog advice from a great source – Alyson B. Stanfield and her Art Biz Blog. She offers great tips on marketing (and more). 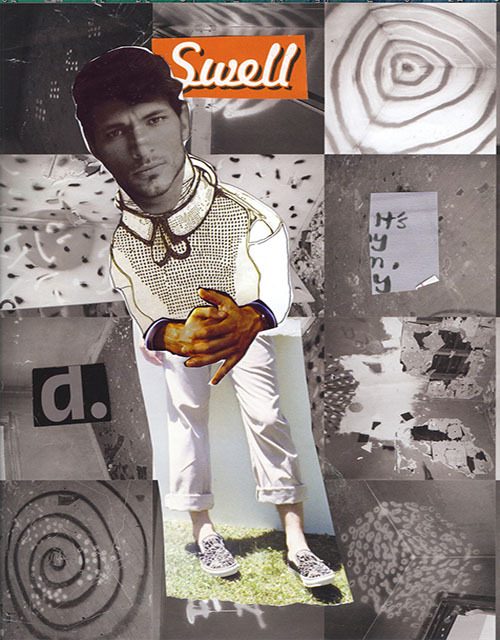 I’m an expert at collage and want to share my ideas about the art of collage. In 2009 I started to write my blog. I was a newbie at blogs. I took an online workshop with Alyson B. Stanfield and Cynthia Morris in 2010 called Blog Triage. I posted several blogs as assignments for the workshop. The 3rd lesson “Your About Page – The Heart of Your Blog” included a link to my collage workshops site where you can read that I say my life is about glue (because I like to put things together). The 6th lesson was titled “Cure Yourself of Blog Envy” and asked us to find blogs that inspire us – in my case – artist’s blogs where the content and images are presented beautifully. I included a link to Gwyneth’s Full Brew. The artist writes “… I am documenting the intersection of art-making and art-seeing, daily life in New York City and…my drawing surface of choice since 2007 is the cardboard coffee cup.” Gwyneth Leech has had incredible exhibition success with her up-cycled coffee cup installations. She also takes wonderful photos of NYC and documents great places for a cup of tea or coffee. At Blog Triage, I learned the best blogging serves your reader and includes links to useful information. The course included 20 assignments. Assignment #10 was titled “Show Some Link Love” – about including good links. I always remind myself to share the links and share the love. 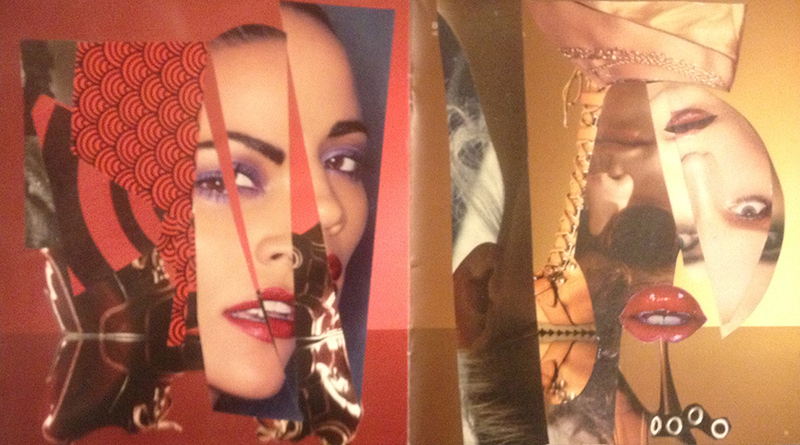 The image below is another one of four collages titled Barneys pasted inside the catalog. One page is about night and the other page is about day. The red lips are a huge kisser. Sending comments is another way to share the love. I got email recently (Feb 10, 2013) from Douglas Beaudry. He has a blog titled The Bearing Edge and designs and sells skate-influenced custom jewelry (wrist cuffs made with leather fashioned with recycled derby and skateboard bearings) – really cool. He commented on an old blog that I posted November 30, 2010 in which I asked and answered a question. Question: How Are the Best Blogs Like a Great Collage? Answer: The best blogs are good looking, engaging, multi-media, explore new ideas, and like the best art, invite you to share the experience! That’s my concept for really good collage. Collage is layered. Douglas Beaudry commented: What a great blog post and certainly served to clear my brain a little bit. I thanked him for the compliment. I don’t know how my post cleared his brain. I re-read the blog How Are The Best Blogs…. Basically – it included a lot of links and was all about sharing links. The original blog included a link to the artist Robert Rauschenberg who had an exhibition at Gagosian Gallery in NYC. I included a link to a Nov 26, 2010 NY Times Holland Cotter review of the exhibition. Both links are repeated here. 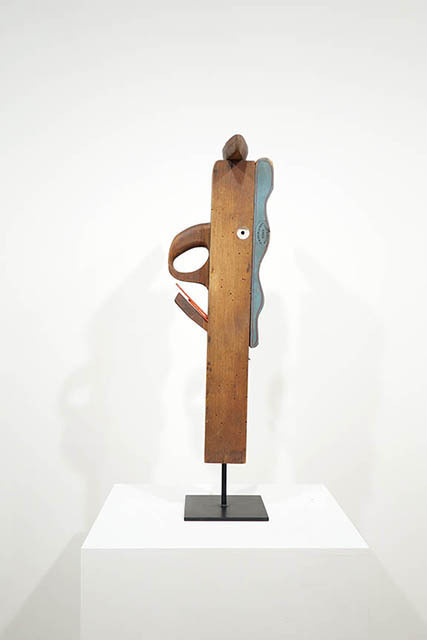 The Gagosian Gallery link connects to works by Rauschenberg. The NY Times link is so well written it is still valuable to read. 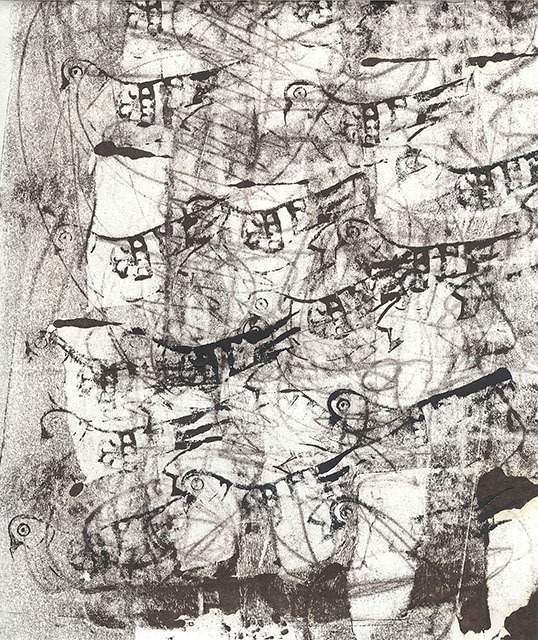 Robert Rauschenberg is one of the most important artists of the 20th century. He has influenced so many artists who followed. The Barneys 4 collage seen below is in black and white and in color over a background that turned from amber yellow to bronze. 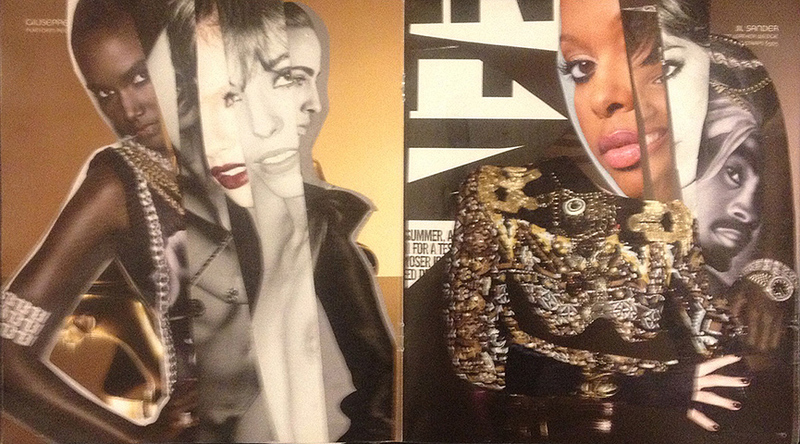 I used magazine images that were printed in color and black and white. The models are a mix and match of men and women. I wanted the focus on the eyes. They are looking at me and you. If you think you want to update or improve your blog (or want to start to blog), I recommend the self-study Blog Triage workshop. Check it out… There are so many ways to do a blog, depending on the audience you are writing for. Following are comments about the media I use. My substrate (background for the collage) in these 4 works was a high fashion Barneys New York catalog I got in the mail. I wish I could get more. I only got one. 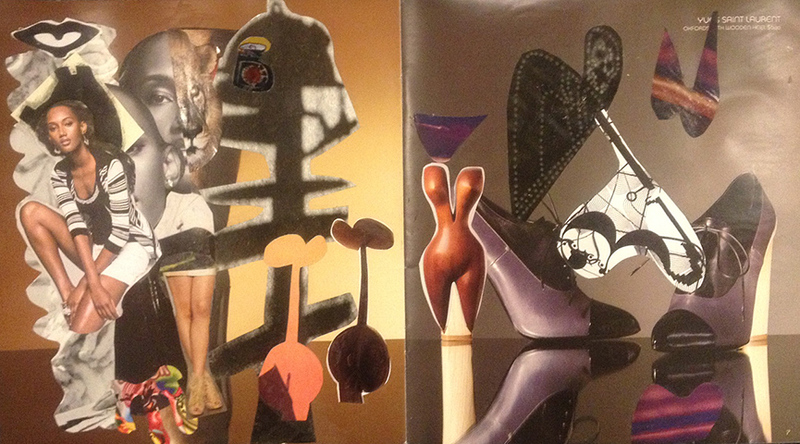 My collage papers were from magazines like W, Interview and ArtForum. I added text and line drawings because I love words, letters and graphic patterns and love to mix drawing, pencil, ink and printed media. I thought about how to marry the old image with the new image and how the content changed with the overlays. I thought about how the 2 pages had to work together and how all the pages had to work as you leafed through the catalog. I love juxtaposing images and making it into a commentary on our consumer culture. I wanted the images to become edgy. Thanks for reading and thanks for your comments. If you have questions about collage, you can email me. Making art is a habit you cultivate. It’s a good habit and very important for artists. But you need a proper space that’s dedicated and a place that makes you feel inclined to work. I’ve had studios in my home and outside my home. Sometimes it’s more convenient to work from your home. Sometimes it’s better to separate yourself from home and work in a space dedicated to just making art. My current studio is a dedicated space with worktables, sink, bookshelves, storage cabinets, my easel, printing press and flat files in one room with overhead fluorescent lights, and an east-facing window. I’ve been in the studio, located in New Rochelle, NY at Media Loft for 5 years and I’ve improved my studio space over the years. Media Loft is a great space for artists. We organize open studio events and have a first floor lobby gallery. The image above is my worktable covered with papers, paints and tools. When I’m working it gets messy. Notice the paint jars in the center of the table. I bought the jars in a retail stores that sells everything you need for storage. I needed to store paints that I custom mixed. Notice the painted canvas sitting in front. It was a clean piece of canvas and I’m using it as a blotter for excess paint from my palette knife. I swipe the paint onto the canvas and I think this work surface will become a collage element in a future work. My table gets cluttered with painted papers as I work, and then I clean it up and organize the materials to make room to continue or start over on a new project. When people visit for open studio events, the space gets cleaned up totally, and people think I work that way. You can see that I don’t. 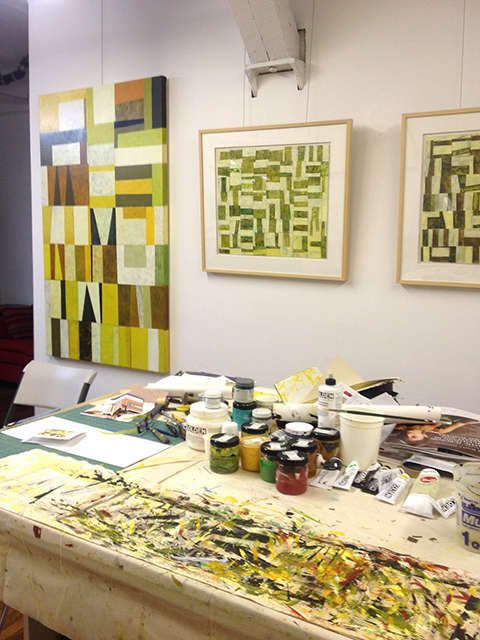 See the painting and collages on the wall behind the worktable. I just had a hanging art system installed in the studio and hung my art as if my studio is a gallery. It looks good when people visit. I also want to look at the painting and collages on the walls. The hanging art is there to inspire me to continue to work on the Metro Series. I am exploring color and want to see the colors I’ve used in front of me. The Metro Series is about geometry. It’s constructed abstraction. Geometry is my reality. Every artist needs a dedicated space – no matter how small. It’s easy to get to work when you have a dedicated space where ongoing projects can be left in progress. It means you can leave at the end of the day and return the next day and everything is set out ready for work as soon as you arrive. But, many artists work in improvised spaces. They make the space work for them. In a recent class I teach at the Pelham Art Center, a gifted student who’s an artist brought up the subject of her studio space problem. She is trying to decide the best place to work. She can set up a workspace in her home basement or in her kitchen. The basement is bigger, but is also a shared space for family and TV. The kitchen would be a happier place – she said it felt right even though it was the kitchen. I asked if she could find a way to store all her art materials, glue and collage tools in the kitchen. I don’t know whether the kitchen is vintage or modern, but, no matter what the style, there are new or vintage pieces that could be used for storage (or maybe there is a piece of furniture somewhere in the house that could move into the kitchen). I found the above image online. I asked for images of antique wood flat file cabinets. I got a huge number of images, including old metal flat files (probably less expensive than new). Similar pieces can be found at ebay or etsy.com or go scout at a neighborhood antique shop, a tag sale or country auction. Maybe you already own something like this. It’s a beautiful piece to store your beautiful papers. The image above is suitable for an office or contemporary styled room. It’s readily available if you look for metal storage files or boxes. If there isn’t floor space, is there a place to set a portable writing desk or stack storage boxes on top? The image above appeals to me. 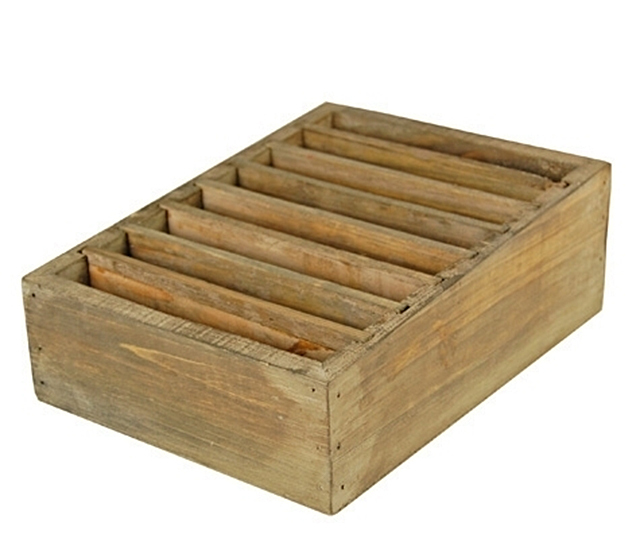 It’s vintage and could hold postcards and small booklets for projects in progress. I would leave it on top of a cabinet or counter in the kitchen as a constant reminder of your creative time. 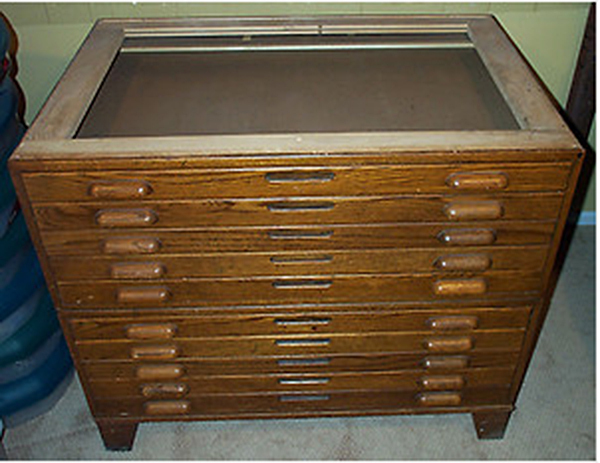 I’ve seen portable desks (writing desks) with storage compartments. Everything is tucked away and safe. The image above shows 2 storage boxes to store collage papers, scissors, pencils, pens, etc. The boxes come in so many sizes and range in prices and are available online and in retail stores. They look fine stacked and could be stashed in a cupboard, on top of a cabinet or counter. I would keep glue in an upright position inside a cabinet. There’s a benefit to taking out materials every time you begin to work on a project because you handle all the media and see things anew. When you return the materials to the storage container, you organize again, preparing for the next time you will work. You can write notes on what your next steps will be so you are ready to begin when you return. I suggested to my student that she could organize her materials (papers) and place them into extra-large plastic zipper bags, sorted by project. Depending on how the kitchen is organized, the bags could be placed in a kitchen drawer, or into a freestanding stack of drawers on wheels, or into a crate. 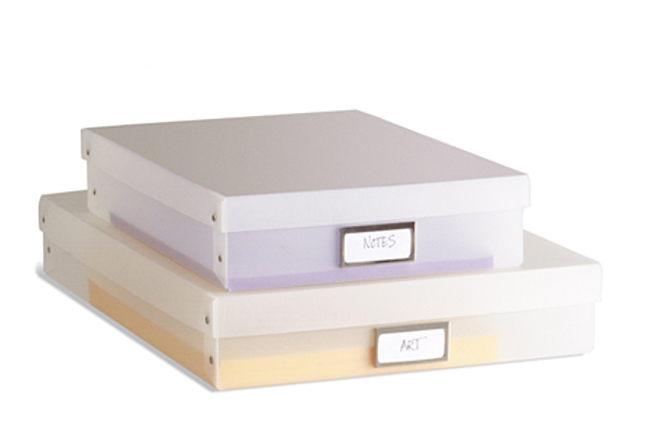 I have stored papers in plastic page separators organized into 3-ring binders. I sorted the papers by color, texture, pattern and image. I place the binders on a shelf with art books (for reference) next to my stack of magazines that are a resource for more collage papers. My favorite magazines are ArtForum and Art News. Check out ebay or etsy.com (storage and organization) for vintage storage pieces if that’s your taste. 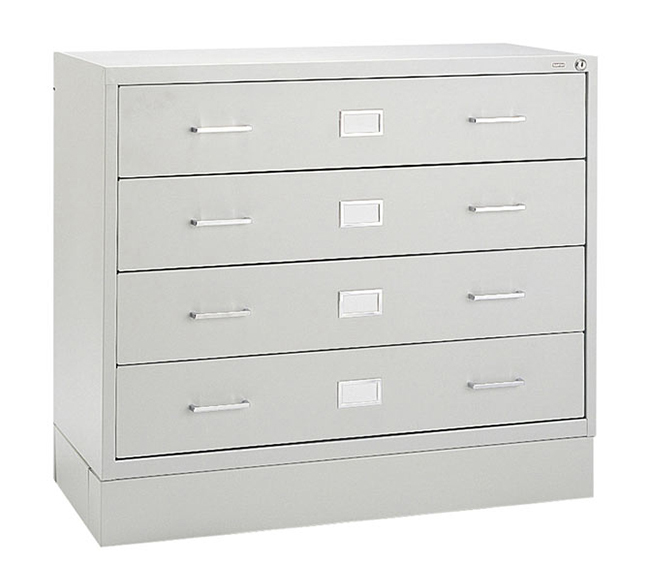 Or go online and locate sources for new types of storage – boxes, containers, flat files, storage drawers, etc. It seems like everyone is into storage solutions today. What solutions have you created? Please share how you’ve organized your personal art project space. Thanks for sharing. I love to use text as a main element in collage. The text are lines and then I add drawing. I find text in art magazine and also in books. I don’t like to tear pages from books, but don’t mind pulling pages from magazines. The magazines are a great resource for collage papers, and some art magazines have a lot of pages. When I find text with a large typeface, I cut the text horizontally so the letters are split into long strips, and the words are not easy to read. 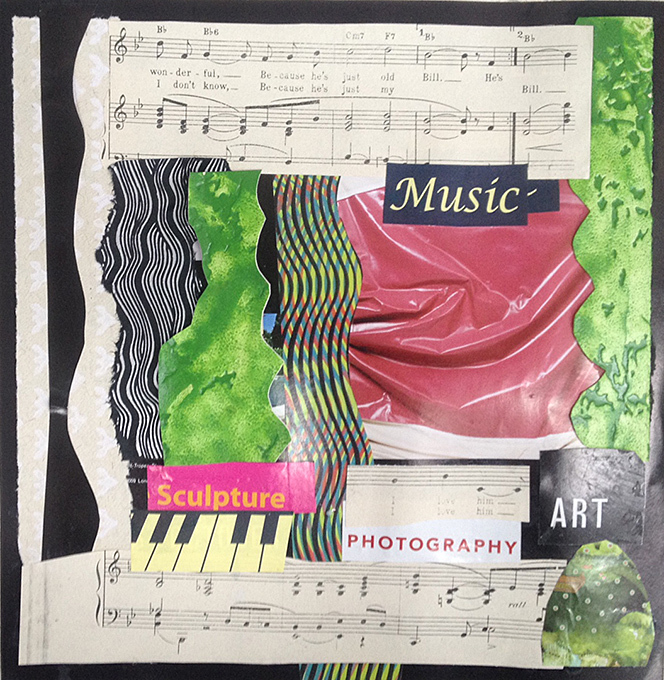 Recently the class I teach at the Pelham Art Center asked to explore using magazine pages with text for collage. I brought the image (seen below) to the class. It’s a small collage. The horizontal strips are all split and layered magazine text. 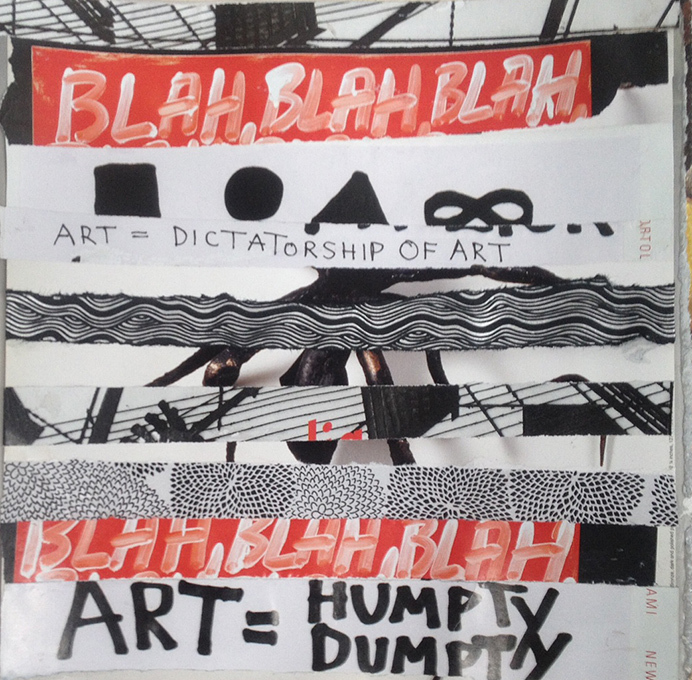 All the text is from magazines like ArtForum and Art News. I like the papers in these magazines. The Strata series is about layering, with a reference to landscape, and a little bit of play. I suggested the class cut and tear the text into thin horizontal strips. Cutting would create hard edges. Tearing would create soft edges. I suggested they organize the papers into visually compatible groups in related colors. I suggested that some strips should touch or overlap. I shared beautiful black, silver and white printed paper with wavy lines, and showed them how to create a soft, torn edge by using a brush dipped in water that made it easy to tear the paper. The reverse side of the hand-made paper is a beautiful dense black. I shared pages of printed text and gave them copies of magazines to look for more text. The images below are by the class members. It was a challenging project and I think everyone was pleased with the collages they created in one evening class session. 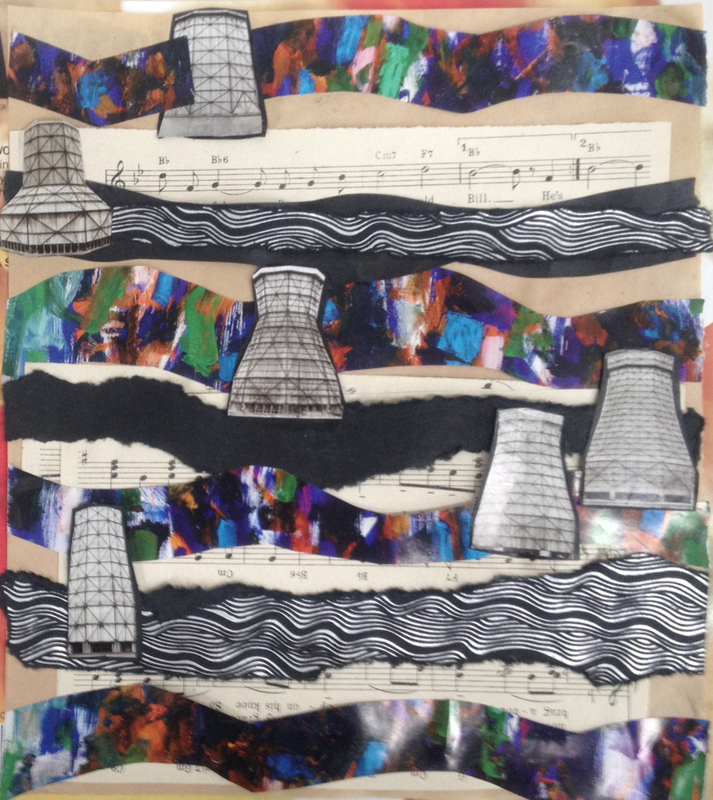 Do you think the collages look like landscape strata? Do you like the text they selected? 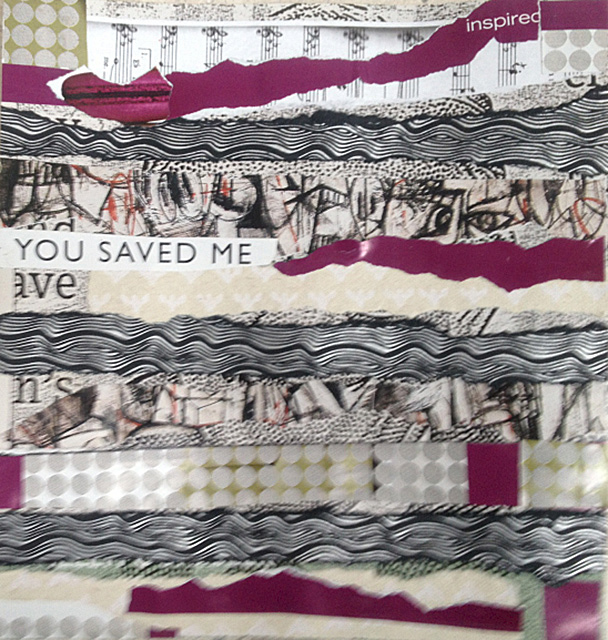 Are you inspired t0 make collage with text?